Devoted Tolkien fans will recognise “Flies and Spiders” as the title of the chapter of The Hobbit wherein Bilbo and the dwarfs enter the dismal forest Mirkwood on their way to reclaim their hoard of gold from the dragon Smaug. In Mirkwood, the flies are a nuisance, but the spiders are a fatal menace. This season in Tasmania, the roles are reversed. It is nominally spider season, but it’s been so dry, and so few morning fogs have graced the paddocks, only a very few sightings of dewy webs have been made. Spider webs masquerading as snow in April of 2006. I tried to take a photo a couple of days ago–we had a mildly foggy morning, but there was only one web in sight, and it was fairly pathetic, so I thought I’d give you the prettier pictures from better years. The flies, on the other hand, made their awful presence felt early, and more ferociously than I’ve experienced in 15 years here. Normally, I would jet (apply an organic fly repellent) in mid to late December. This year, I had 3 flystruck sheep before I could get the first jetting done in mid-November. And despite the repellent, I’ve had three more struck this past week. Each struck sheep must be caught, the affected wool clipped away (usually somewhere on the breech) and the area treated with a concentrated solution to kill the maggots (sorry, for you who are squeamish) and protect the area from further strikes. Dewy spider webs in the native garden around my house. This photo was taken in February 2013. And flies are not the only side effect of our record-breaking dry. (We’ve had a total of 25% of our long-term average rainfall for the current quarter, October to December.) One consequence, and a relatively benign one, is the sighting of more than the usual number of snakes, as they are forced to move to find water. Despite Australia’s reputation for a plethora of venomous snakes and spiders, trust me, the flies are worse. One of the best paddocks at the moment, one I call Old Cabin. This photo was taken on the 14th of December. On the right side of the fence is the neighbouring property. The main consequence, though, is I will have to sell about 2/3 of the flock—700 sheep or so—in order to ensure I have sufficient quantity and quality of feed for the remaining 300. As long-term readers of Yarns will know, I made a commitment last year to allow my sheep to live out their natural lifetimes on the farm, forage permitting, rather than selling them at 5 or 6 years of age as is done for most commercial flocks (Designing the Unexpected). While I’ve yet to learn what “natural lifetime” turns out to be, Alice is 12 and Old Leader was 11, when she succumbed to skin cancer near her eye a month or so ago. Old Leader (HRH) in her prime. Her leadership and knowledge are sorely missed. Because she was still very much the leader when she died, the mantle of leadership has not yet clearly been transferred. I notice the flock tends to move less in her absence, but on the other hand, they’re better about following me! Old Leader was still going strong through spring, except for the cancer, which the vet and I tried unsuccessfully to treat. However, the cancer was accelerating, and between the pain I assumed she was experiencing and the annoyance of flies, I felt it was time to euthanise her. There’s probably an entire Yarn to be written on the subject of pain (which we all experience to some degree at times in life and doesn’t automatically justify death as an alternative) and suffering, which I’ve come to feel is the real criterion for choosing to end an animal’s life. Much the same issues as for humans, though arguably it’s easier to manage the pain in our case. A few of the kids enjoy one of the pockets of green still left on the place at the end of November. These are all in areas where seasonal streams or soaks can be found, so there is still a bit of soil moisture to help the growth along. As I go through the flock this week to choose which to keep, I am making sure all the animals with names and histories stay. At this point, I’m planning to keep 200 ewes (some in each age group for wisdom) and 100 wethers. It will take me 3-5 years to rebuild the flock numbers from this base. I wouldn’t buy in sheep, for two reasons—first, there is too much risk of bringing in diseases like footrot. Secondly, and at least as importantly, it will take time for the landscape time to recover. 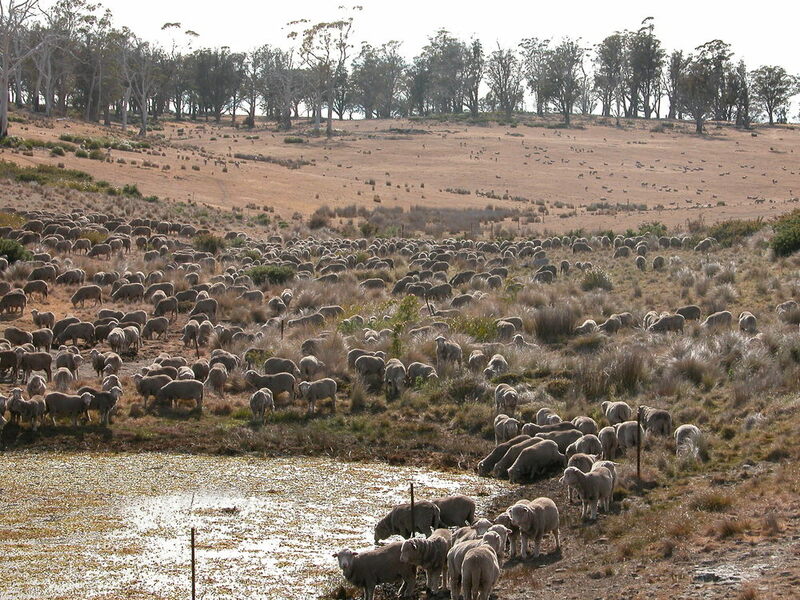 It’s not just this spring’s record dry resulting in the lack of feed: we’ve had 3 years of 70% or less of our average rainfall, so the flock has been eating through the natural “capital” of the property—the grass reserves. At this point, there simply isn’t enough resilience in the system for it to bounce back—it will be a long, slow healing and rebuilding of the capital. One of the long-grass sections the flock and I have been working to graze down ever since I started shepherding. This photo was taken the 4th of November this year. While it’s nowhere near as rank as it was, it still looks like pretty good forage to a sheep! Although this is in many ways heartbreaking for me, there are some hopeful things to hold onto. First, I’ve brought the sheep to this point in good physical condition through shepherding and attention to the details in how I have utilised what forage there is. In hindsight, it would have been better to sell earlier in the season, but it’s important to remember what you did and didn’t know at the time you made a given decision. There was a reasonable chance of enough rainfall to pull the whole flock through—it just didn’t happen. 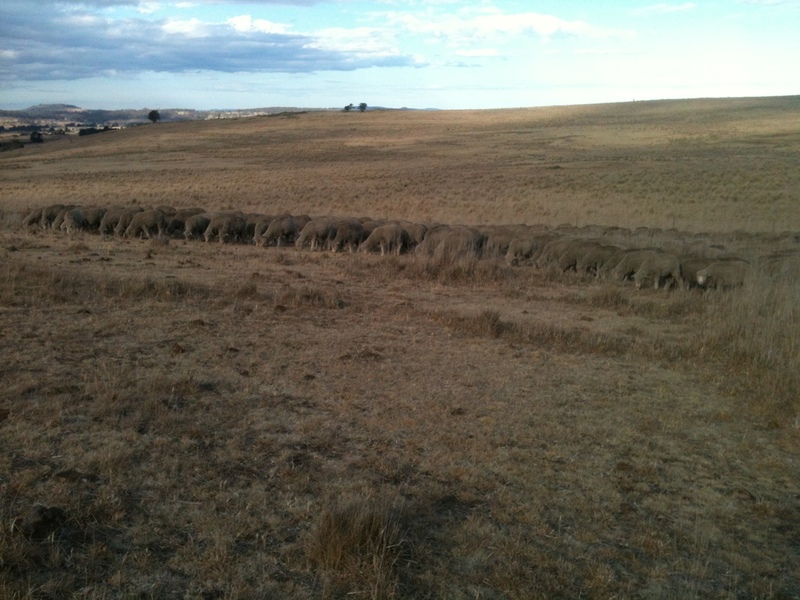 A little farther along in the same paddock a few days ago (6 weeks after the shot above). The grass is still long behind the sheep (they are just grazing out of the rank area), but it’s no longer green except right in the tussock clumps. There’s nothing wrong with dry grass as fodder, as long as you aren’t expecting mamas to be making milk on it. It’s just not growing. Thank goodness I decided not to lamb again this year! Another hopeful thing is I have enough yarn in inventory and wool in store to carry WGW through the next couple of years as I rebuild the flock—I was chuckling to myself yesterday that I have more resilience in my yarn stock than in my pasture supply. The last sighting of the mountain duck clutch December 3rd. Mama is just out of the frame, calling them madly to her. You can see how much notice they are taking! And finally, Rebecca Robinson of Augustbird Hand-Dyed Yarns and I have been experimenting again. This time it’s a joint venture, motivated by Rebecca, to create a silk/merino blend. It’s 30% tussah silk and 70% WGW merino in a bouncy 5-ply or sport weight. Design Spun worked with us to create the yarn, and produced a small spin which we now have in our hot little hands. There are only two colours in WGW balls—natural and hawthorn. Because the spin is limited, and experimental, I’ve decided to restrict my sales to my website—so you’ll have to go online to find it. Rebecca will hand-dye her share of the spin, making it available on her website Augustbird. I wish you and your loved ones a relaxing and peaceful holiday season. Older PostBonus Track: How long is a piece of string?